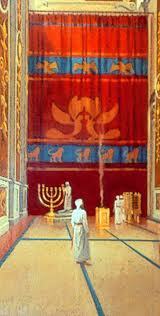 Both the Tabernacle and the Temple in Jerusalem had an inner room called the “Holy of Holies” which had a thick curtain or veil that separated it from the outer room. This inner room was God’s special dwelling place in the midst of his people. Once a year the high priest solemnly lifted a corner of this veil to enter the room bringing blood and holy incense. This occurred on a prescribed day called the Day of Atonement (Yom Kippur). The high priest then passed into the immediate presence of Jehovah. The tearing of the veil at the moment of Jesus’ death dramatically symbolized that His sacrifice, the shedding of His own blood, was a sufficient atonement for sins. Furthermore, the tearing of the veil upon Jesus’ death laid open the sacred place. The veil rent top to bottom gives ample space for all to enter, to approach the throne, receive God’s grace and to commune with Him. God’s presence is now accessible to all who humbly seek Him.